The Hoggs of Fife Munro hiking boot is a classic looking boot made from top quality full grain waxy leather upper, with minimal stitched seams for all round water resistance. 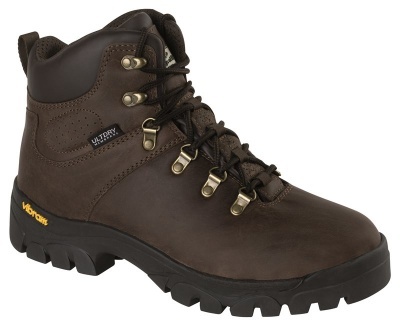 A superior hiking boot designed for all types of terrain packed with many key features. A superior ULTDRY membrane has been incorporated into this boot with a padded bellows tongue, making these hiking boots fully waterproof and breathable. For extra comfort, the Munro hiking boot has a cushioned cut-away collar and a removable cushioned insole, with ball-of-foot and heel extra absorbent pressure point inserts. The Munro boot has been designed to withstand rough terrain. A superior Vibram rubber outsole offers fantastic grip and durability and a super-rigid mid-sole plate for superior boot rigidity when on tough terrain.